As a self proclaimed neat freak, my bedroom has always been my favourite part of our family home. I'm one of four children, a family of six plus my pride and joy aka..my dog. I'm sure you can imagine that due to there being so many of us, things can tend to get messy; But I, thankfully, take after my mum who is incredibly tidy. A couple of years back, me and my mum redecorated my room from light blue, to pebble grey; It has a very parisian style, incorporating white and cream colours for decoration. But lately, I've been so tempted to paint my room white, but before I do that I aim to get new furniture so everything is white and looks how i envision it to, but until then I have to work with what I've got! What I'm trying to say is, I'm basically going to show you the bits of my bedroom that I won't be changing - the things I love! A few months ago I upgraded my bed from my broken antique double, to this white wooden Hemnes bed from IKEA. As a big element in my bedroom, it really did make a huge difference and finally helped me decide on the vision I had for my bedroom. Big up my dad for spending the whole afternoon building it! About 6 months ago I bought myself a polaroid camera from Amazon. 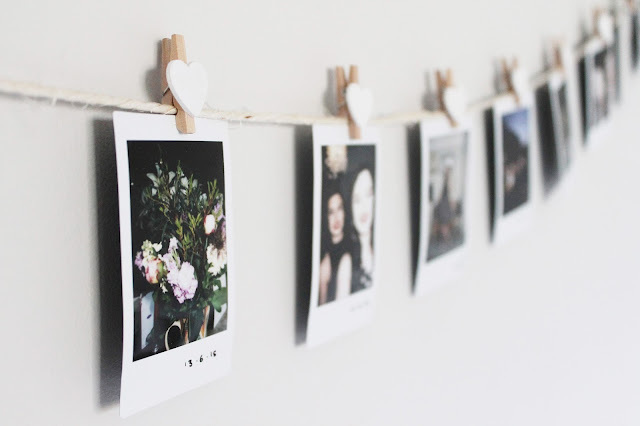 I've always loved photography, and I really love the style of polaroid pictures, and I'd always wanted to install a polaroid wall into my bedroom. I used string, some hooks at either side, and my favourite polaroids to create this nifty piece of room decor. It jazzes up a otherwise bland wall as well as being a great reminder of some wonderful memories with my friends and family. This little area here is situated in front of my window, and is where I do my makeup pretty much every day. 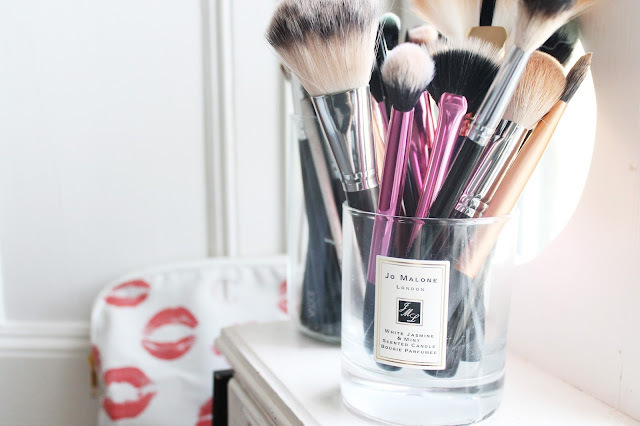 I use old candle jars as brush holders, and I just love how everything fits on my windowsill perfectly and is easy for me to access in a morning. My makeup bag is from Charlotte Tilbury and fits so much in it. 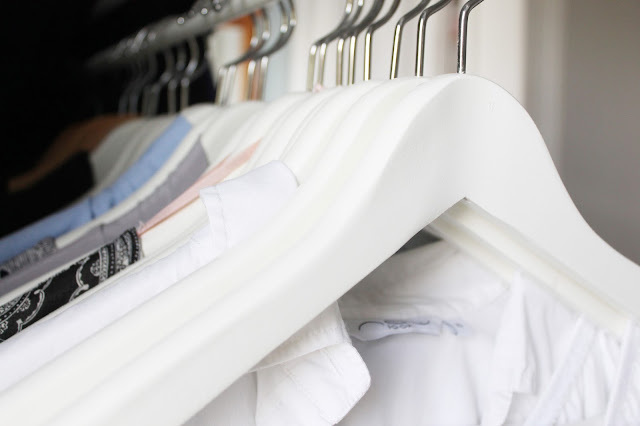 About a year ago, I decided I wanted to downsize my clothes storage from a huge wardrobe to a clothes rail and found a lovely white rail over on Amazon. All of my favourite pieces find their way onto here, with basic clothes fitting in my chest of drawers. I find that since having this in my room, I've been ruthless with getting rid of clothes I don't wear, and it's helped me get over my hoarding! My wooden coat hangers are from IKEA. I'm realising this is the first you guys will ever have seen of my bedroom! It's not quite how I want it yet, but I love it and it's my safe haven. I'll do an updated post when I've redecorated and created my dream room don't you worry! What do you like about your bedroom? Oh my, your room is literally room goals. So pretty!! Your bedroom is so gorgeous! I would definitely say that I am a complete neat freak too, so I get where you're coming from. My favourite part about my room would have to be my make-up area. Love all these bits, especially the idea of a polaroid wall! 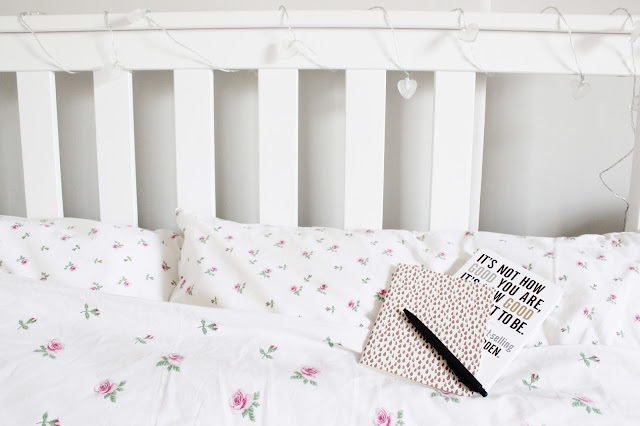 Your bedroom is so bright and pretty. So you've completely inspired me, I'm looking at my bedroom now like " Time for a upgrade"